Cancer Society? So this month, my blog is dedicated to all my friends out there who are still smokers! The following is a letter from your heart….endorsed by Ms. Boom-Boom LaRue! I would like to introduce myself to you…..l know you, intimately, but I doubt you even give me much thought. I am the symbol of love, and I am the sole reason you are alive at this moment….l exist for you! I am your heart! I love you and because of that I remain on duty for you 24/7. I never sleep but I make sure you can, and then I make sure you wake up. But you have been trying to kill me….you have little regard for my dedication to you. You insist on smoking! Maybe you did not realize that one out of five deaths from heart disease are directly related to those filthy cigarettes! I call them coffin nails! Why do you continue to feed me nicotine? It is making it nearly impossible for me to get oxygen for you, it is raising blood pressure, and it is making me have to work faster and harder than I was ever intended. I need to pump 2 gallons of blood around every day, and those cigarettes are an obstacle to accomplish that! You are wearing me out before my time! Damn it! That nicotine is speeding me up and trying to make blood clots! I am trying to protect you, but it is really difficult! And, by the way, everyone else around me is also complaining about the same thing! Smoking is damaging all of us in here……your lungs, your bones, your pancreas, and your skin, to name a few of us. You may not know it, but your poor lungs are struggling to keep you from developing bronchitis, pneumonia, and other diseases such as emphysema. Eventually, with emphysema, you would have to breathe through tubes attached to an oxygen tank! And smoking is a carcinogen causing all kinds of cancers. Believe me, they are all highly unpleasant and perhaps fatal! Your mouth, larynx, esophagus, pancreas, kidneys and bladder are all begging you to bring them some relief! Please….. stop smoking! A cigarette has a fire at one end, a fool at the other, and a little toxic tobacco in between! Cigarettes are killers roaming the earth and traveling in packs! So be on guard! Your smoking bothers us, but it has the potential to kill you! 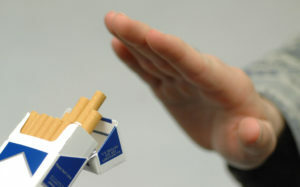 We all care about you and we are cheering loudly for success in the effort we hope you will make, to give up “the habit!” Giving up smoking is not easy…..we are very aware of that. Each day is a battle, but you can win the war! Boom-Boom cares……really cares about all her friends . I am absolutely on your cheering team! Go for it! And while you are at it, perhaps you would consider working in a little exercise…..take a walk with Jesus!